With fructose solution, Japanese neurophysiologists learned to do transparent any part of a body including a brain. The fructose solution is not breaking the structure and a form of transparent part. Takeshi Imai from the KyotoUniversity and his colleagues learned to do transparent part of a body, experimenting special solutions which can change refraction coefficient at different fragments of a body. As biologists explain, the increase in its value allows to make “invisible” molecules of fats and sugars in tissues of a body which usually absorb waves of visible light. During these experiments scientists noticed that solution of fructose possesses ideal coefficient of refraction at a temperature of 37 degrees. Biologists added in it the special substances suppressing reactions between fructose and some substances in tissues of a body. 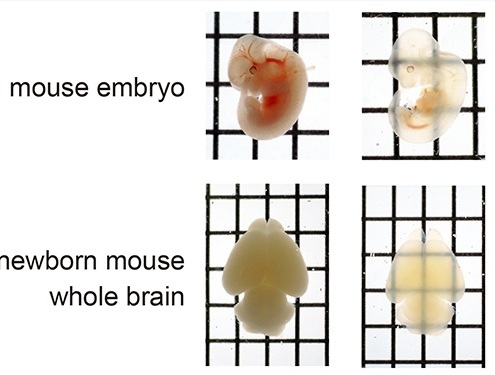 Biologists checked solution in operation on several germs of a mouse, and also preparations of a brain of a young and adult rodent. In three days of a soaking in fructose solution all test samples became completely transparent. According to scientists, the cellular structure and a form of all preparations wasn’t damaged or deformed that allows to use this technique for studying of functions practically all body organs. As consider Imai and his colleagues special interest represents studying of the discolored brain, whose transparency will allow to trace all elements of large chains of neurons.